What is the Innovation Initiative? An exclusive 2-week hackathon – with a focus on inspiring students to further develop disruptive technology, and bridging the gap between an idea and the next big technological advancement. We are opening up various facilities in Edmonton for our participants to use, to further build their prototypes. This is also an amazing opportunity to find potential employment opportunities at Telus! Prizes are of a $2,000 value. 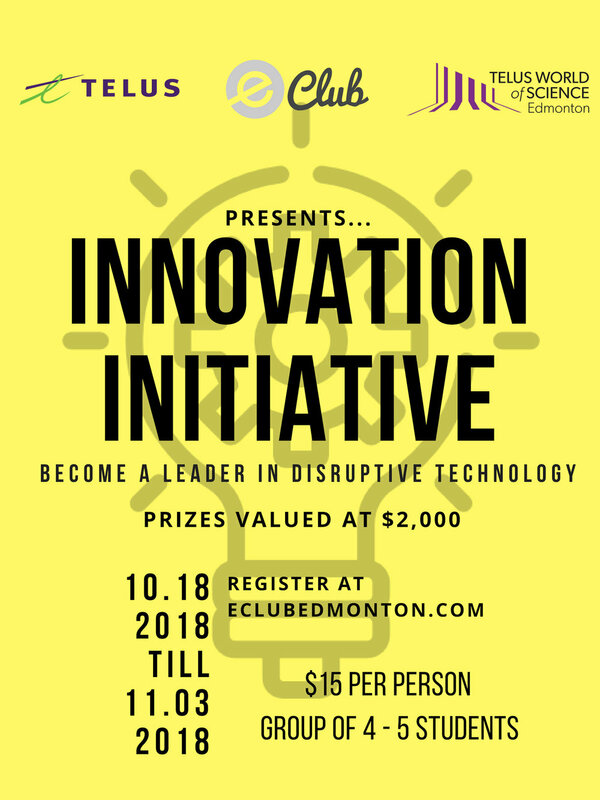 Students from ALL post-secondary institutions in Edmonton, as well as ALL faculties and disciplines are welcome to participate in this competition. Because this competition will involve a coding/technical aspect, ensure team member have at least have basic - intermediate programming skills. On October 18th, 2018 we will be announcing and distributing the hackathon documents – it is where you will find the topics. From October 18th, 2018 till November 3rd, 2018 – students will have access to the facilities listed below in Edmonton, at designated times, to further develop their prototypes.